A packaging manufacturer has been served a reduced £297,000 fine after a Health and Safety Executive (HSE) inspector uncovered poor, longstanding practices involving electrics and machine guarding at the company’s premises in Northfleet in Kent during September 2014. Under the sentencing guidelines the court could have set the penalty as high as £2.5m but the company’s poor trading position and swift remedial action led to a more lenient sentence. The breaches included unsecured cabinet doors that exposed unprotected three-phase electrical conductors in a switch room that was open at the time of inspection; a damaged and open guard on the corrugator and an open door in the corrugator, which contained unprotected three-phase electrical conductors on a control. They found five other panels in a similar condition. “The specialist’s report said, ‘if you touch three-phase electrics, you’ve not got a lot of chance of coming out of it alive’,” Hassell stated. As Hassell was leaving the premises, he discovered that an external consultant who specialised in corrugated machinery guarding had been on the site on 8 January 2014. “I got his report and his photos and a lot of my notices reflected the recommendations he’d made for improvements,” added Hassell. After the director charge was dropped in August 2016, the case was heard at Maidstone Crown Court on 30 January by H H J McDonald who determined that the company’s culpability was high, harm category 1 – since the seriousness of harm was Level A with a high likelihood of harm. 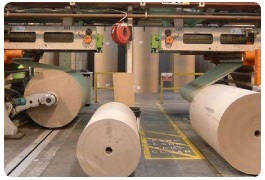 W E Roberts (Corrugated) had an annual turnover of £13m, placing the manufacturer in the lower end of the medium range for a starting fine. “There is no decided case to indicate what the judge should do but we agreed with the defence that he should look towards the lower end of that scale because it seemed harsh to fine the company £2.5m [the top of the category range for high culpability],” said Hassell.